The Journal of Theoretical Educational Science (JTES) is a scientific, peer-reviewed and open access electronic journal and we welcome research and reviews with both theoretical and practical focus on education. The Journal of Theoretical Educational Science (JTES) aims to shoulder an effective role in establishing an educational system in which individuals can acquire the knowledge, skills and competences of 21th century. 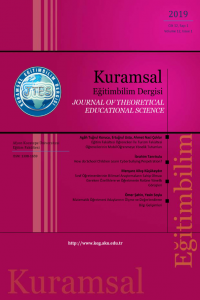 The Journal of Theoretical Educational Science (JTES) aims to contribute to the discussion of the educational policies of Turkey and the reorganization of these policies by collecting the studies in all steps of education ranging from elementary education to higher education in an international and novel platform. The Journal of Theoretical Educational Science (JTES) aims to establish a common ground in which scholars and teachers follow the trends in research and foster their academic development. •	Studies that suggest theoretical and/or application models for educational problems.